Well, school starts back tomorrow for Dekalb County, and about this time every year, it seems, as I take note of the school calendar, I have to suppress a panic attack. I don’t know why that fear of a new school year is still in me. I got my Master’s degree in 2008, over six years ago, now, so there have been six first days of school since I’ve actually had to go. Our daughter Emmaline is just a year and a half old, and her day care is year-round, but for whatever reason, about the time school starts, I start to feel the anxiety start in my toes and climb up my legs until I’m just about in full freak-out mode. And I have been reflecting on this strange feeling as I’ve been meditating on the story of Jesus walking on water, of the disciples crying out in fear, of Peter becoming frightened and sinking. And I am starting to realize that fear is universal, that it exists now like it did back in Jesus’s day, and that this is a particularly important dynamic for me to talk about because it is the case that I am scared of everything. Are there any scaredy cats in the room? I’m not saying I never take risks, that I live in a padded room and only drink clear broth or whatever. I’m just saying that I have come to the realization that I am driven by fear. And it is no wonder. Fear drives the world. It’s one of the most powerful forces the world has, fear. It drives our politics, it drives our economy; fear drives the world. It is no surprise that fear is so strong. It is part of our biology. Back when we were hunter-gatherers, it was good to be scared all the time, you know, that the lion that lived outside your cave would maul you to death. But now, well, let’s just say that society has evolved a lot faster than our biology has, and the politicians know it. It’s a lot easier to get votes by making us scared of the other candidate than it is to talk about your own virtues, particularly when the list of your own virtues isn’t all that long. It’s not much of a leap from that kind of fear to the kind that can rule your life, that can leave you unable to move, that makes you want to pull the covers over your head and try again tomorrow. And so it is that I find myself scared a lot. Maybe that surprises you, since it isn’t the case that I keep my mouth shut very well, since I sometimes kick up hornet’s nests. But that doesn’t mean I don’t totally stress out before I open my mouth, before I take on a problem. It doesn’t mean I get a great night’s sleep the night before, as I worry about every possible outcome, as I fear what people will think of me, or what this will mean for the church, that sort of thing. Fear is so powerful that six years later, even when I’m not in school anymore, all it takes is remembering how scary it was to go to school each year to nearly give me hives. I think it is one of God’s greatest practical jokes that I was called into ministry, considering the fact that I am totally and completely painfully shy. So each year, as I geared up for school, I’d try to sort of walk through the first day in my head, where I would sit, who I would talk to, that sort of thing, because I’m really that shy. There were few scarier things than being thrust, once again, into the concrete jungle of the schoolhouse, and as I think about the biology of the whole deal, it makes sense that fear drove me since I don’t know of many places that survival of the fittest applies more than a middle school classroom. So it does my heart good to know that I’m not the first person to feel the weight of fear, and even if I started every school year scared, at least I wasn’t like Peter, making a fool of myself in front of Jesus. In the story we heard this morning, Jesus went away to pray and sent his disciples out in a boat. It was very early in the morning, some time between 3-6am, that Jesus came down from the mountain, only to discover that a storm had pushed the disciple’s boat far into the lake, tossing them about and making it hard for them to stay afloat. Now, you’d think that Jesus would see this situation, say, you know I sent them out on the boat, this is getting dangerous, and I’m Jesus after all, so let me just calm the storm. And yet that is not what happened. Instead, he walked out to the boat on top of the water like some ghoulish apparition, so you can understand why the disciples are so scared, why they assume he is a ghost. 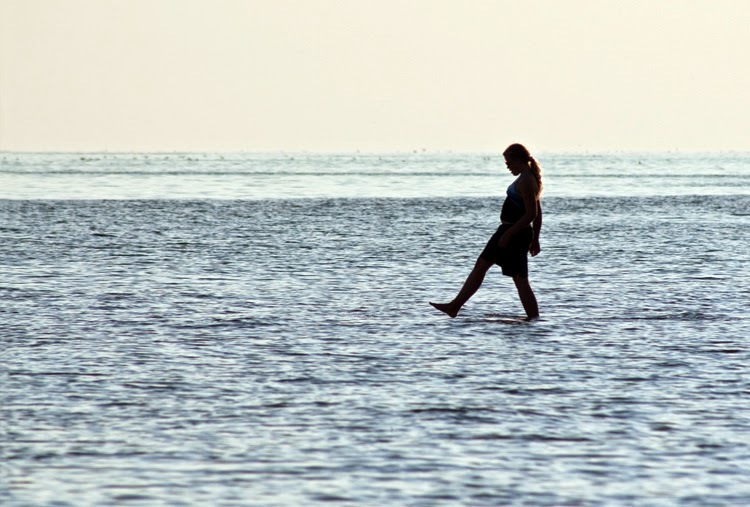 It isn’t every day that somebody walks on water, so I’d probably think the same thing. In fact, it was ancient legend that evil lived in the depths of the water, so as strange as it sounds, a ghost was the most likely explanation. But it wasn’t a ghost, of course, it was Jesus, and he walks calmly over to them and says, “Take heart, It’s just me, don’t be afraid,” not that he did anything about the storm. So when Peter says, “Lord, if it is you, command me to come to you on the water,” maybe it was less about Peter wanting to walk on the water and more about him wanting to get out of that rattrap of a boat. And so Peter gets out, but the storms don’t stop. I mean Jesus is there, and you’d think that by this point he would have calmed the waters, but the storm didn’t stop, and Peter got scared, which is something I cannot blame him for, and he starts to sink. Now, the Bible doesn’t say that when Peter started to sink, Jesus reached out and let him keep walking on water. The Bible says that Jesus caught him. There’s a subtle difference there, because, friends, the things that cause us fear do not go away. I want to stop for a minute and acknowledge that in the church throughout the centuries, we’ve sometimes done a bad job of talking about what happens when you become a Christian, when you decide to follow Jesus. We make it seem like if you’ll just come to church and throw a little money in the offering plate and pray a little bit, everything will end up being all cupcakes and unicorns. And sure, it feels really special when you find a faith community like this one that is so open, so kind, so warm and inviting and so intent on helping others on the way. But after a while, the newness rubs off, the business of following Jesus loses some of its luster, and it all just becomes so normal. This kind of thing especially happens when we encounter fear. I don’t know about you, but there are few things that can make me feel worse about my faith than being afraid, because I know the bits in the Bible about Jesus saying “do not fear.” I know that he looks at the disciples and says “take heart, it’s just me, do not be afraid.” And so when I get to the part in this story when Peter starts to get frightened at the weather and starts to sink, the words that Jesus speaks—“you of little faith, why did you doubt?”—well, they feel like a punch in the gut. If I’d been out on the water I’d have been scared, too. To be honest—and you won’t hear me say this very often—I kind of disagree with Jesus here. Peter was right to be scared. But of course, Jesus knew that. Jesus knew Peter was scared, and if he’d just wanted him not to be scared, he would’ve stopped the storm. But that’s not what he did, because that’s not how life works. As much as I wish that I could sell the Christian life by saying that for the low, low price of your devotion to Jesus Christ, you’ll never be afraid again, it is the case that the things that cause us to be afraid do not go away. Fear does not go away. Jesus does not always stop the storm. You know, we have some people joining the church each of the next few weeks. I hope that if you aren’t already a member here at North Decatur, you’ll think about joining them. But I can’t make you any promises about bad things going away just because you join the church. In fact, when I accept people into the church, I sometimes paraphrase the Lutheran pastor Nadia Bolz-Weber who tells every person who joins the church the same thing: the one guarantee I can give you as your pastor is that I am going to disappoint you. The church is going to disappoint you, too. And when that happens, you have a choice. You can move on to greener pastures, find somebody who disappoints you less, a better church, a better pastor. But if you do that, you’ll miss out on unbelievable moments of grace that come from persevering through the storm, for while it is the case that Jesus doesn’t always stop the storm, it is always the case that when we venture out of the boat, Jesus catches us. Rather than letting the boat drift off into the middle of the lake, Jesus comes to us, God comes to us, reassuring us, reminding us that there is no place we can go that God is not, that there is nothing we can do to make God love us any less. And when we find ourselves fearful, Jesus catches us, holds onto us, does not let go. The agents of fear are strong, but love is stronger, God is stronger, for God is love. Do not fear does not mean we’ll never fear. It means that when we do, God is with us. We don’t face fear alone, for God is with us always, and fear is no match for love. So, students, as you gear up to start a new school year, rest assured that while it can be scary to go back to school, everybody, I mean everybody, is just as scared as you are. You aren’t the only one. And as you get settled, and get into your new routine, as you find yourself covered up with homework, if you find yourself picked on, remember that Jesus is stronger than your fear. Yes, life can be scary. But Jesus promises us that there’s nothing we can do to make God so mad at us as to leave us alone. So don’t be afraid. The things that scare us are no match for God, and the church is here for you, praying for you, looking forward to hearing the stories of the great things you will be up to this year. And teachers, you sculptors of learning, you modern-day superheroes, do not fear. Yes it is the case that the world so often expect you to create something out of nothing, but know that it is worth it. On days when it seems like too much, God will not leave you adrift. Not everyone is equipped to accept the calling you’ve accepted, and yet it is among the most important calling from God there is, for there is nothing, nothing so important as sharing the love of God with others. It is the most important thing, and particularly the teaching of children, for Jesus says that children are first in the kingdom of God. It is not easy, resisting fear. Some days it seems like a fool’s errand. But let us never forget that while fear is nearly the most powerful force in the whole world, it is only nearly so, and thanks be to God for that.